Engineering Services at J.B. INDUSTRIES, Ltd.
CONCEPT DESIGN for automation and processes. ELECTRICAL CONTROLS DESIGN, for machines and total systems. ELECTRICAL CONTROL PANELS DESIGN AND LAYOUT WITH B/M. ELECTRICAL CONDUIT AND CABLE SCHEDULES. EQUIPMENT INSTALLATION ENGINEERING, (Mechanical, Electrical, and Piping). 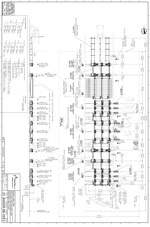 AIR AND HYDRAULIC PIPING SCHEMATICS. MACHINE PIPING ARRANGEMENTS WITH B/M. MACHINE WIRING ARRANGEMENTS WITH B/M. 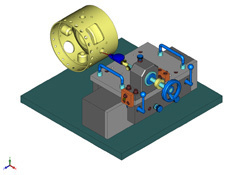 We specialize in Computer Aided Design, utilizing AutoCAD™ (2d and 3d) and SolidWorks™ (3d Parametric Solid Modeling) software. JBI has a talented staff, capable to provide solutions for your most difficult applications. JBI can provide you with a complete documentation package, including Mechanical Arrangements with Bills of Material, Mechanical Details, Electrical Schematics, and Installation Arrangements. Metal Process Line Terminal Equipment (Down Coilers, Pinch Rolls, Strip Shears, Coil Cars, Peelers, Bridles, Scrap Cars, Coiling Reels, Belt Wrappers, Outboard Bearing Supports, Strip Accumulators). Tube and Pipe Handling Equipment for Oil/Gas Drill Pipe and Tubing/Conduit, including equipment such as: Tables with Escapements, V-Roll Conveyors, Pinch Rolls, Forged O.D. Flash Scarfing Machine, Kick-In/Kick-Out devices, Walking Beam Transfers, Let-Down Bucks , and Cooling Conveyors). Fixtures for non-destructive testing and inspection. Load Tables for Pipe Bending Machines. Automation for Induction Heating Systems. Automation for Forging and Press Transfer.